Governor Perry is well known for his brags that “the Lone Star State’s winning mix of low taxes, reasonable regulatory structure, fair court system and world-class workforce has been paying dividends” and bringing business to Texas, even when it isn’t true. For the day to day Texan, their freedom is becoming increasingly an illusion too. To have real freedom, you need choice. Increasingly Texans have no freedom, because they have no choice. This week, Attorney General Abbott confirmed the ban of releasing information to the public as Tier II reports in the 1986 Emergancy Planning and Community Right to Know Act (EPCRA). What this means is, YOU, yes You! can no longer find out what dangerous chemicals are stored by businesses in your town, or your neighborhood. The sort of chemicals for example, that were the cause of the West, TX explosion last year. 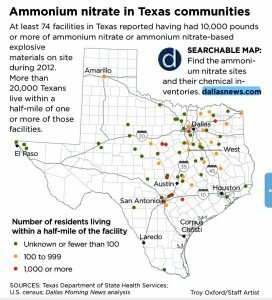 The Dallas Morning News in their research found 74 facilities that 10,000 Pounds or more of Ammonium nitrate or ammonium nitrate-based explosive material on site. wouldn’t you want to know this stuff was happening near your home, school, or work place? WFAA has a great video report showing Texas regulation at it’s best/worst. Confusion. Gov. Perrys claim for low regulation is in fact obfuscated by the fact that plants like the one in West, TX are regulated by as at least seven different state and federal agencies. OSHA, the Environmental Protection Agency, the Department of Homeland Security, the U.S. Pipeline and Hazardous Materials Safety Administration, the Texas Department of State Health Services, the Texas Commission on Environmental Quality and the Texas Feed and Fertilizer Control Service. If you think this creates a smooth, efficient, low cost and safe way of managing risk, then “good luck with that”. The good news is Texas isn’t much worse than many others, at least we still have the ultimate freedom, to leave. Unless of course it’s via the Mexican border where Abbott continues to press for the Federal Government to be tougher, fence more, fence frequently border control. What Texas does a best is apparently marketing the illusion of freedom via the cheerleader in general, Gov. Perry. Previous Previous post: Free Speech, Censorship?